At the age of 17 Shayna and her boyfriend at the time were traveling from Appleton to enjoy a day at Hartman Creek State Park. On the way, they made a wrong turn on Rural Road and started to travel past the Inn. Shayna asked him to stop and pull over in front of the Inn. Shayna approached the gazebo overlooking the Crystal River on the grounds of the Inn. There was a magnetic pull and knowing like she never felt before. Shayna knew that someday she would be married at the Inn in the gazebo on the banks of the Crystal River. 15 years later…. Paul had never heard this story of Shayna’s magical connection while standing at the Crystal River Inn gazebo long ago. The couple decided to go away for the first time while dating. Paul was in charge of making plans and reservations for the overnight getaway. 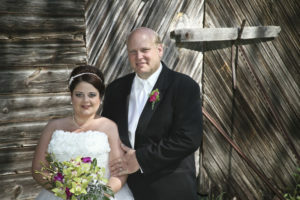 To Shayna’s amazement, Paul booked a stay at the Crystal River Inn on December 31st, 2008. When the couple arrived at the Inn the Innkeepers showed them to their room for the evening. They stayed in Helen’s Summer Room which was the only room in the Inn that overlooked the river and the gazebo. It was a magical winter evening with a full moon shining down and illuminating the banks of snow with a blue hue, the river flowed peacefully by as snow gently fell. They decided that evening that fate lead them to this special place and when they got married that they would have the wedding at the Inn at the gazebo. On May 28th, 2011, Paul & Shayna said their vows at the Crystal River Inn with their children, family and friends surrounding them. Every love story has twists and turns and there were many of them in the years that followed. However, in February of 2018, their dream came true as they purchased the Crystal River Inn. Paul & Shayna absolutely love the Inn, being Innkeepers and being a part of the Waupaca community. We welcome all to relax and experience the serenity, peace and magic that the Crystal River Inn offers all!